Slab gate valves are usually used for the oil & gas pipe-lines. 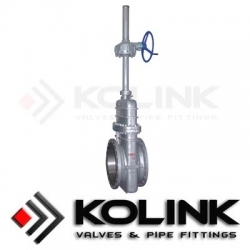 Slab gate valve are manufactured with a full bore, slab gate, rising stem OS&Y and floating seats. Slab gate is a simple solid gate design, featuring metal-to-metal seal between gate and seats, to apply for the most severe service condition, including corrosive and abrasive fluid environments. A floating seat is designed to match the slab gate. A belleville spring and O-ring between each seat and body ensure a tight seal against the slab gate. The floating slab gate uses the natural force of line pressure to obtain a dynamically tight downstream seal in high-pressure differential applications. Low-pressure sealing is accomplished with an o-ring that energizes the seat and minimizes corrosion and debris build up. Common trims are available. Double block and bleed capability and automatic relief of excess body pressure are standard feature of this seat design. 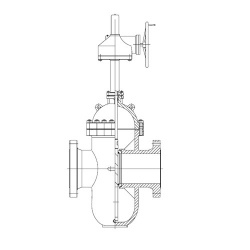 Slab Gate valve design minimizes and eases the maintenance allowing for the service operations to be done without the removal of the valve from the line. Valve Materials: WCB, LCB, WC6, WC9, C12, C5, CF8, CF8M, Duplex Stainless Steels, etc. Would you like to get more products information or order it, please call us, or click Inquiry Now to fill in the Form. It helps you get more informations you need to trade confidently with valve suppliers.